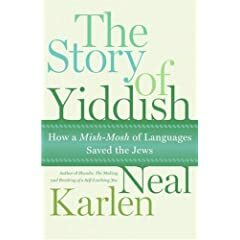 In The Story of Yiddish: How a Mish-Mosh of Languages Saved the Jews, Neal Karlen recounts the history of the Yiddish language and examines its relatively recent renaissance. Popular culture references abound and make the book as entertaining as it is informative. So, may we talk Diaspora, Mr. Bobby Zimmerman? Ah, Bar Mitzvah-ed Bob, who joined the Jewish frat at the University of Minnesota (Sigma Alpha Mu—go Sammies!) and was soon kicked out for his atonal piano bangings on the frat piano…So he moves out and alchemizes into Bob Dylan, beatnik and Woody Guthrie “Bound for Glory” acolyte. Gee, if only he knew Woody Guthrie was steeped more in Yiddish than hobo-ing, musical history may have been changed! And may I name drop, because there is nobody here in Minneapolis to namedrop: if you see a stretch limo you know it’s either Prince inside, or 15 high school seniors on the way to prom. Dylan to Herzl to “The Big Lebowski”—the circle of the true Kabbalah is complete. LASTLY, Dylan’s high school notebooks sold for tens of thousands of dollars a couple years ago at Sotheby’s—and some of those notebooks were in Yiddish. Now, the fact that he occasionally hangs with Chasidic Jews means he has to have learned more Yiddish; the Chasidim are the last people on earth who speak Yiddish in day-to-day discourse. 3. Sister Sledge, Keep it in the Family. Yiddish is made up of 25 languages, with words plucked from every different country they were kicked out of in the Diaspora. Yiddish, as the great jazzman and author Mezz Mezzrow (Really the Blues) wrote, is very close to what was then called “jive” then Ebonics, and now “African American English Vernacular.” (AAEV) Like AAEV, Yiddish allowed Jews to let their hair down, be themselves, and make fun of their oppressors—a quite necessary thing to do if you want your people to survive. But KEEP IT IN THE FAMILY!!!!!! Now “Car Car,” a children’s song, is the exact manner by which most Jewish kids begin learning Yiddish—their parents lapse into the language when they don’t want their children to understand sensitive or putatively “adult themed” conversation. Ah, but eventually we did understand, after spying from the backseat with our ears on our parents in the car-car. This manner of universal Jewish kid eavesdropping is how I learned shmuck, shmendrick, shlemiel, shlimazel, and shmo. Besides being the greatest song ever, Rubberband people is also the story of the Yiddish speaking Jews—no matter what anybody did to them, they always bounced back, held themselves together, and then wandered—or ran—on. 7) Lou Reed, ne’ Lou Rabinowitz, Waiting for the Man, with Nico and the Velvet Underground. I think we all know, in the Jewish/Yiddish world, who the Man/Woman Mr. Rabinowitz is waiting for: GOD. The song’s NOT about getting wasted, unless it’s nearing Purim, the one holiday where Jews are commanded to get drunk. Or perhaps “the man” it’s the liquor storeowner waiting for the shlepper who delivers the cases of Mogen David. Perfect music for fleeing from enemies, and keeping the hope alive for redemption in a land of Jews and God. (Of course, Springsteen isn’t Jewish, as Adam Sandler points out in “The Chanukah Song, “though my mother thinks he is.” Still, the Boss knows from his exiles, be they Jews from Poland or motorcycle meatballs from New Jersey. Has there ever been a better description of the delicious feel—a fabric you can almost taste like the berry-- as you put on your best yarmulke in the shtetl?